The Patient Protection and Affordable Care Act (PPACA) imposes a 40% excise tax on insurance premiums above a threshold. This tax, intended to help limit the growth of health care costs, was referred to as the Cadillac tax during debate on the legislation because the threshold was set high enough to exempt all but the most expensive insurance policies when it goes into effect in 2018. 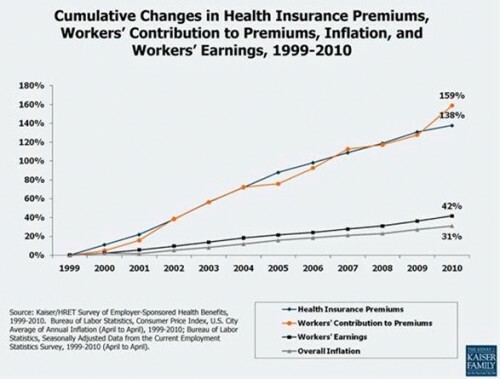 The tax thresholds are indexed to inflation, but health insurance premiums have historically grown faster than general inflation, as shown by the chart below from the Kaiser Family Foundation. If these trends continue, the thresholds for the excise tax will affect a larger and larger share of the distribution of premiums every year. In our recent working paper (also available here) we calculated the expected value of these thresholds in 2018 and 2030 and (using 2009 dollars) compared them to the distribution of premiums in 2009. The threshold for family coverage will be $27,500 in 2018. Assuming health care costs grow at 6% per year (which is low by historical standards), the 2009 value of the threshold is $27,500 x 0.949 = $15,757. This was roughly the 80th percentile of the family premium distribution in 2009 according to the figure below, which has a vertical line marking this point (graphs reproduced from Kaiser Family Foundation). The calculations for the individual premium distribution are $10,200 x 0.949 = $5,845. So the thresholds will fall at about the 80th percentile of the family and individual premium distributions in 2018. Starting in 2020 these thresholds are indexed to the CPI, but medical inflation has averaged about 2.5 percentage points above GDP growth since 1970. 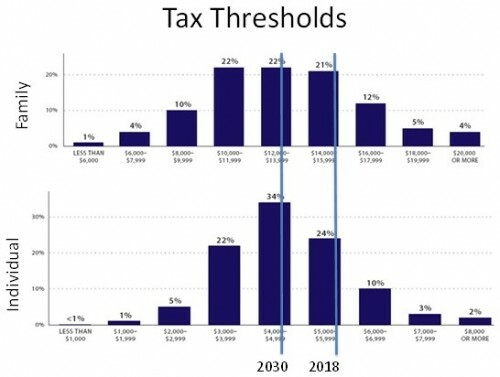 If we assume that health care costs will grow 2.5 points faster than inflation (CPI + 2.5 is more conservative than GDP + 2.5), then these tax thresholds will fall at about the 50th percentile of the premium distribution in 2030. As we discuss in our working paper, these calculations suggest that the excise tax will affect a lot of workers and firms pretty quickly. The expected effects of the tax include making private insurance coverage less generous, causing employee contributions to increase, shifting total employee compensation from health benefits to wages, and encouraging more workers to take up public insurance if they qualify instead of private insurance. It may also raise a great deal of revenue. In our opinion, reducing the generosity of some employer-sponsored insurance is desirable because it helps reduce health care cost growth and bring down the federal deficit. The shift in compensation from health benefits to wages is also probably a good thing for the same reason. The tax-induced shift from private to public insurance is a more ambiguous outcome. If public insurance is adequately funded we have nothing against it, but we are concerned that this shift may not have been accounted for in the official scoring of the law. UPDATE: See also Under PPACA, which workers will shift from private to public insurance? Individual premiums would be calculated similarly.to be $6037.